Tony Riggins is second in line and definitely not telling you what time he showed up to secure such a good spot. The head of the line at the White Elephant Preview Sale. Mid-line of the White Elephant Preview Sale. 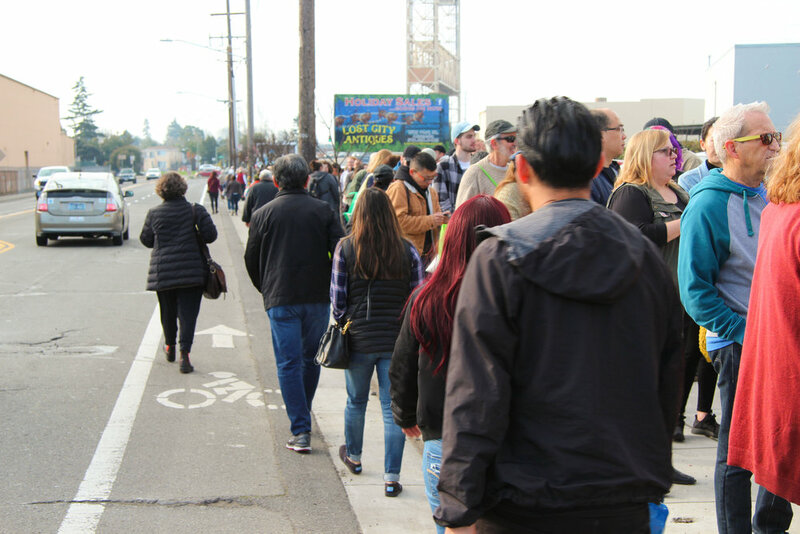 The end of the line wrapped around the block and extended down Fruitvale Avenue. Erica Terry Derrick and her partner. The White Elephant Sale has security to check wristbands and manage the flow of people. These people were in the first wave of entrants of the Preview Sale. Joanne has been volunteering with the White Elephant Sale since 2015. She works in Bric-a-Brac. Some things you’ll find in the Bric-a-Brac section. The Housewares section was incredibly busy. The Jewelry Counters were often crowded…. …sometimes two or three rows deep.